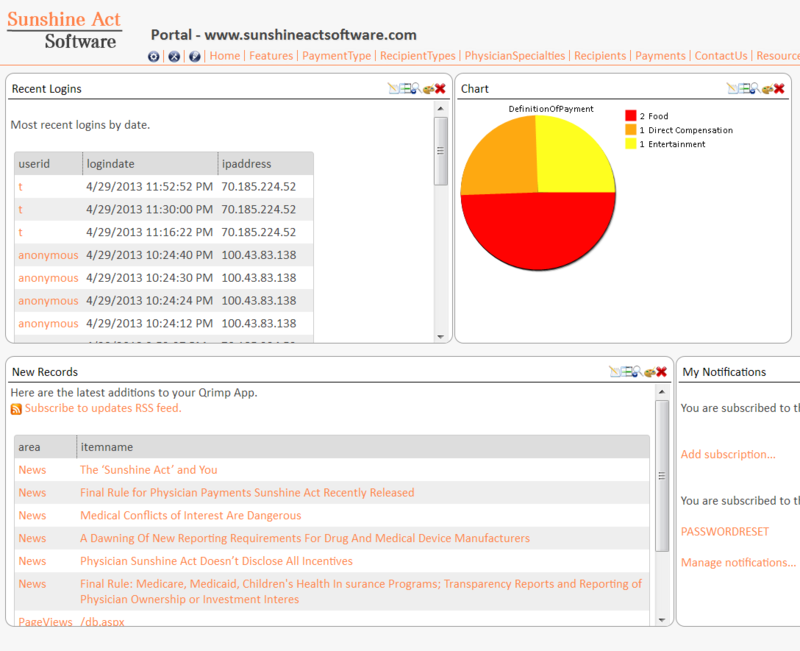 Sunshine Act Software comes with all the great features you need now. We help you track everything you need to get compliant today -- don't procrastinate! Contact Us for a tour today. Recipients are individual physicians or teaching hospitals to which your organization transfers value in the form of money, stock, samples, education or any other item which has a monetary value. 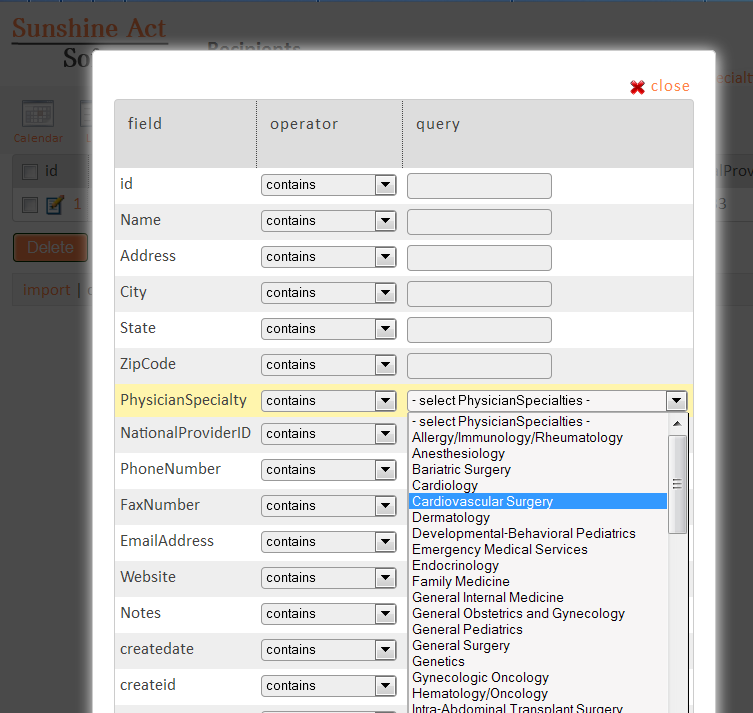 Sunshine Act Software makes it easy to add new physicians or hospitals to your reporting system. Users can easily search for existing recipients or add a new recipient if it isn't already in the system. You can also create group based policies that let you specify who within your organization can manage the list of physicians you work with. Plus, we have an easy Physician Import feature that makes it easy to add lots of physicians from an existing Customer Relationship Management system like Salesforce, SAP, or any other enterprise system that can export to Excel. Value transfers include, but are not limited to: Charitable Contribution, Consulting fees, Direct Compensation, Dividends, Education, Entertainment, Food, Gift, Honoraria, License fee, Research, Speaking fees, Travel or trip... Logging all those value transfers can be a real nightmare, so Sunshine Act Software makes it easy. Just find the recipient using an easy recipient search, then click Add Payment.... Most of the form is point and click. If you need to enter drug sample information or other related items, just type them in and click Create. It's very easy and saves a lot of time over more complicated systems. 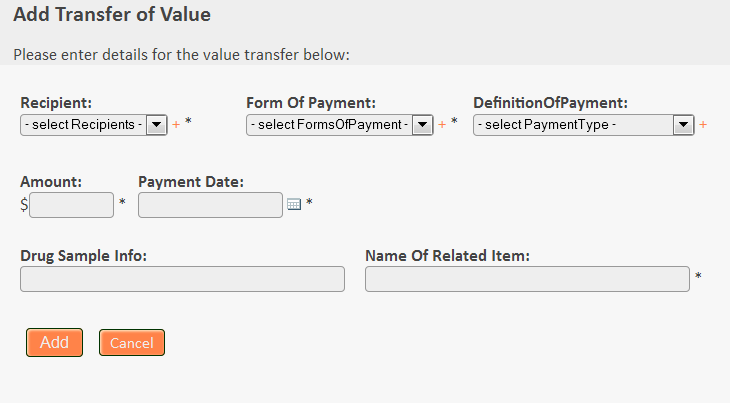 Drug reps and other people in your organization can quickly add payments or other transfers of value by selecting the recipient's name from the list of recent entries. Our easy to use dashboard lets everyone who uses the system keep their most relevant information right in front. Quickly add new portals to the dashboard, reports, or links to frequently used recipients. 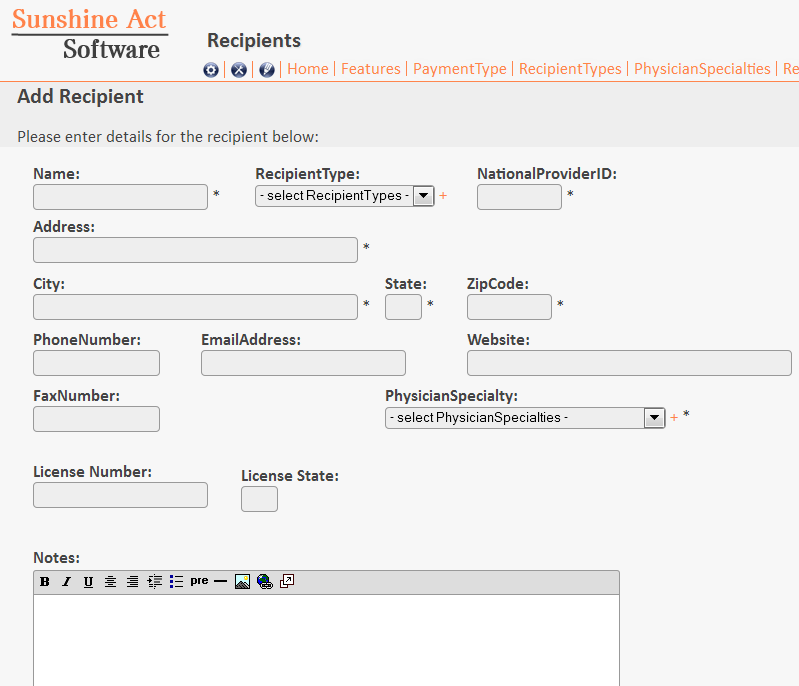 Create custom queries, lists, and messages to communicate internally and stay updated on the latest updates to your Sunshine Act Software. For large organizations, it can be difficult to manage a long list of recipients. Sunshine Act Software's comprehensive recipient search makes it easy to find recipients when you need to add a new value transfer entry. If you'd like to learn more about Sunshine Act Software's features, including some of those below, please Contact Us Today. Don't delay, mandated reporting starts soon and you want your organization to be ready! Import / Export to/from Excel, CSV, Tab Delimited formats or existing enterprise systems.